I'm going to enjoy this meme. I love macros! This is my houseplant, a primula. In the past my house plants have always died. But two years ago I was given a geranium by the mother of a student and it is still alive. I now have a couple more plants, including this primula. 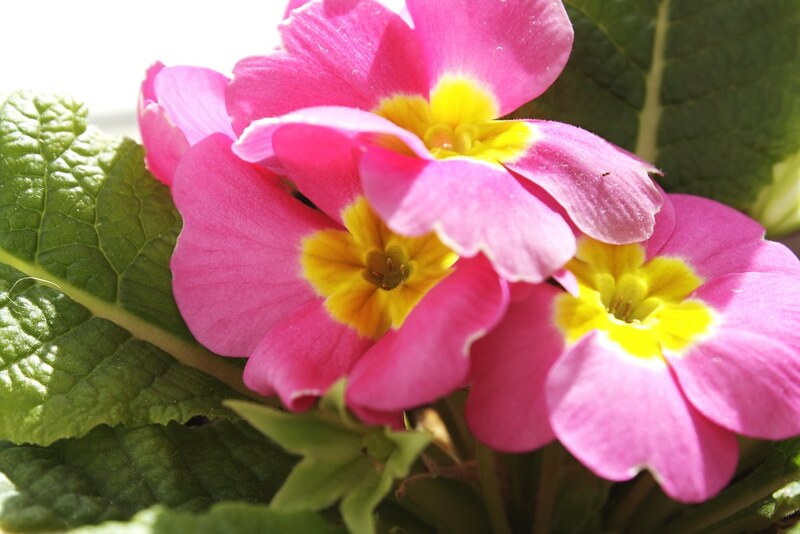 Primulas are primroses. Primroses, I read, are "herbaceous perennials." I have no idea what that means yet! I'm learning as I go and loving every minute of it! To view more macro images, see Lisa at Lisa's Chaos. Lovely flowers. Keep that baby alive! Welcome to the fun. You need to do a couple of things to get the whole plane in focus. First off, always use a tripod -- this allows you to stop your lens down for increased depth of field (DOF). When you do that, your shutter speed is likely to be too slow to hand hold reliably. Your primula is gorgeous, what a color! It looks so strong and healthy. Soon we shall see these beauties outside too. Beautiful ! it's so nice to see some flowers in this grey weather ! These are beautiful blooms! Love the bright cheery centers! Nice! Our primulas (outside) are in bloom as well. That's the West Coast for you! Thanks for dropping by my blog and the lovely comment. i love the color of that flower!.... wow.. great shot.